Dowler, L & Spence, N (eds) (2007), Challenging health inequalities - From Acheson to Choosing Health. Bristol: Policy Press. Mosley, P & Dowler, E. (eds) (2003), Poverty and Social Exclusion in North and South. London: Routledge. 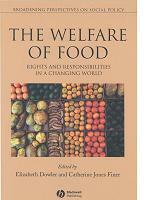 Elizabeth Dowler, Sheila Turner with Barbara Dobson (2001), Poverty bites: food, health and poor families. London: Child Poverty Action Group.